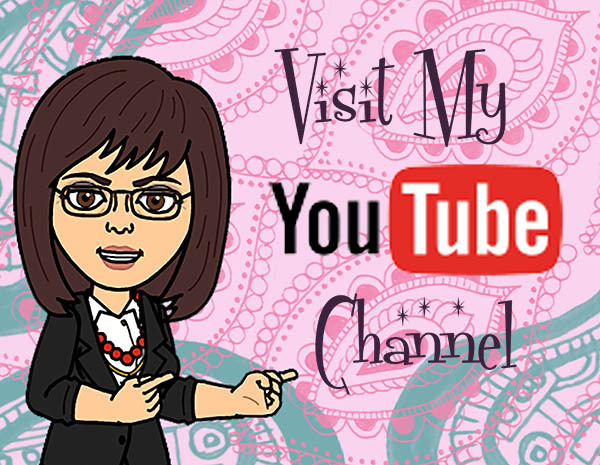 Hello bloggers and welcome to my blog! Congratulations Shirley – please email me (keren.howell@ntlworld.com) with your postal address! 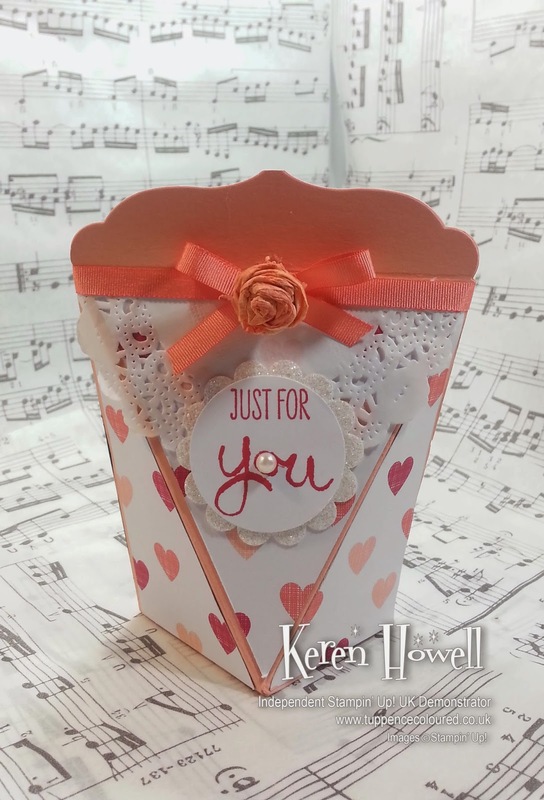 Back to Business As Usual – today’s project is this pretty little gift box. It holds itself closed – to get at the contents you just squeeze gently at the outer edges – and would hold a few sweets or a small gift (some jewellery for Mum on Mothering Sunday, perhaps?) I've also made a batch of these boxes to hold mini Easter Eggs. They're quick and easy to do. Cardstock – 8 ½ inches by 6. Score at 1 inch and 5 inches on the short edge. Make a small mark on the score line on the long edge at 2 inches and another at 6 inches. You can see how it goes together in the tutorial. I finished off the project with a bow from the Calypso Coral Ribbon and added a tiny rolled crepe paper rose (see here if you want to know more about making the roses). I hope you enjoyed the project. Do, please leave a comment to let me know if you tried this - and I'd love it if you followed either this blog or my Facebook page! UPDATE- I've been told that some people are having trouble getting their box to sit flat. I think it's because the tension that the design relies on for the self-closing action is too tight. If you cut the card about 1/4 inch deeper (that is, 8 1/2 by 6 1/4) so that the base flaps are 1 1/4 inch deep, this may help. Thank you. Great idea. Must make some of these! Haven't tried it yet, but got one for a luncheon favor the other day. Now I can try it myself. Thanks! 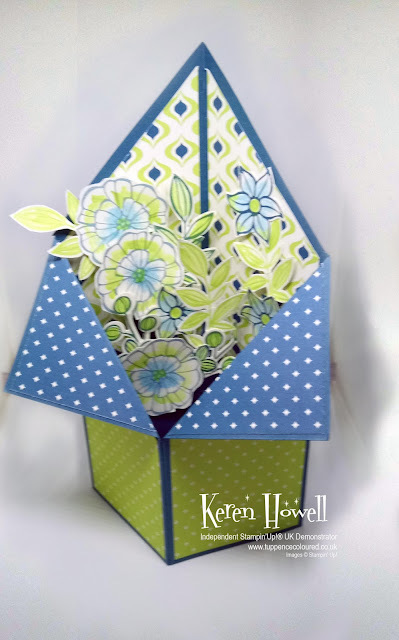 What an adorable project Karen, l can't wait to give it a go. Thank you for sharing the details. Love it!! I can't wait to try it!!! It's wonderful!!! Awesome tutorial! Can't wait to make this project. I did have a problem with the audio quality, but think I can find my way around, so to speak, by watching and reading. The measurements and folding will be my challenge! LOL Thanks again for sharing your talent! Thank you for this wonderful tutorial ! I did try it and the result is awesome ! Again : thank you ! Please check my little box here : https://www.facebook.com/tiktakro . Forgot to tell : I've linked to your tutorial in the first photo of the box . Love this box, it is just fabulous. Do you still have the diagram available? My I please have a copy of it. I love comments! Thanks for taking the time to leave one. Use the reward club code when you shop with me! Click for a pdf copy!